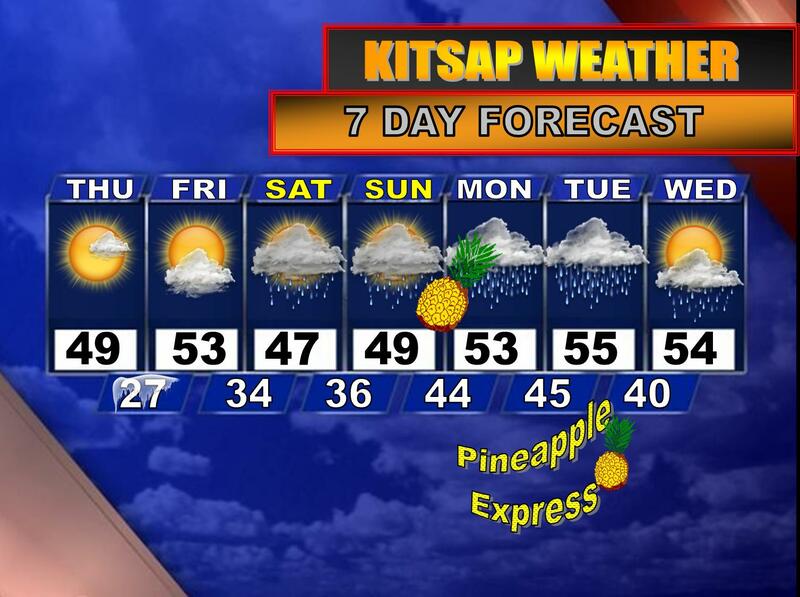 All Aboard the Pineapple Express! I did my best to make the title of this blog post sound as pleasant as possible, but in reality what is in our future may not be very pleasant at all. In December we rode the Polar Express and in just a few days we could hop onto the Pineapple Express, and doing such a thing in March isn’t very common. So what is a “Pineapple Express”? You may or may not have heard this term used in weather reports, but usually meteorologists use it to describe a tropical plume of heavy, warm moisture extending from the Hawaiian Islands to the Pacific Northwest. On the satellite it looks like one big firehose. In fact, I found an old picture illustrating a Pineapple Express well! The above photo is actually a satellite picture of the Pineapple Express system we experienced in January, except back then we were shadowed from a lot of it. This time around the Kitsap Peninsula could be in on some of the heavier amounts. Oh goody! Let’s talk about tonight and tomorrow first because it’ll be another cold one! Lows will dip well into the 20s with the clear skies we have right now and tomorrow will be another mostly sunny day with highs warmer in the upper 40s to lower 50s. Tomorrow may feature a bit more in the way of high clouds, but overall it’ll be pleasant. More clouds come into the picture on Friday, but we should get a decent dose of sunshine with highs in the 50s once again. Rain moves in for the weekend with plenty of cloud cover, but the rain won’t be relentless. Just periods of steady rain and even a few breaks every once in a while. A pretty typical March pattern. And then we bring out the fruit salad with extra Pineapples for late Sunday night through early Wednesday as some warm, tropical moisture overtakes our region. If you are a skier or snowboarder, I suggest you hit the slopes this weekend because early next week looks quite treacherous as heavy, warm rains will affect the mountains too. Right now highs early next week in the lowlands look to be in the low to mid 50s, but there is the potential for those temperatures to be much warmer. For now I’ll be conservative. The mountains will likely see highs in the low to mid 40s with rain. Because of the active weather ahead I haven’t exactly put much time into studying the long range but from the looks of it we do settle down with periods of showers and sunbreaks.